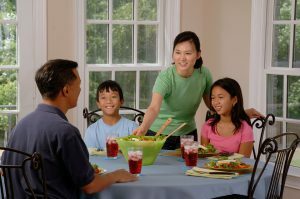 Meals can provide a great time for families to eat and visit in a pleasant and relaxed setting. However, for some families, mealtime can be a struggle. For example, does your child dislike vegetables? Does he or she want to eat the same foods all the time? Have you ever said “finish your plate or no dessert?” Here are some tips to help parents, caregivers and children build healthy feeding relationships. Be a role model; choose healthy foods for you and your family. Offer a variety of healthy foods, not just what your child is used to. Meals should include at least three of the four food groups from Canada’s Food Guide. Snacks should have at least two of the food groups from Canada’s Food Guide. Younger children have small stomachs and need to eat more often than adults. Plan meals and snacks at regular times, approximately two to three hours apart. WHERE food and drinks are offered. Have food and drinks at the dinner table and include the whole family. Turn off the TV and put away toys: get rid of distractions. Distractions can increase the risk of choking, as your child is paying less attention to eating. Children’s appetite changes from day to day. This is normal. Don’t try to force a child to eat. This can make eating a negative experience. WHETHER TO EAT from the choices offered. Children know when they are hungry and full. They won’t starve themselves. Allow them to leave their plate unfinished. Sometimes they will eat very little at a meal or snack. This is normal. A child’s portion tends to be smaller than an adult’s; consider this when serving them. Offer healthy foods and let children decide how much to eat. Children will be more likely to enjoy new foods and eat well when eating is their own choice. Do not use tricks, bribes, punishments or rewards, as this may lead to negative feelings about food in the future. Keep trying to offer new foods; it may take 15 or more tries before a child accepts a new food! Children may be more likely to try foods they help make. They can start helping at any age with small tasks, and work their way up to cooking. For example: setting the table; stirring or washing vegetables and mixing the salad. eats very little or skips an entire meal. wants to eat the same food all the time. Is impatient that meals are taking too long. drinks too much milk or juice. does not drink enough milk. For more information and suggestions on ways to manage these common feeding challenges, check out “feeding toddlers and young children” at healthyeatingstartshere.ca.